Over the last several weeks, I have thoroughly enjoyed experimenting with various beer mixes. It’s become a bit of an obsession at this point. Not only have I discovered some winning combinations, but I’ve found the exercise to be quite enlightening when it comes to how different flavors work with each other. 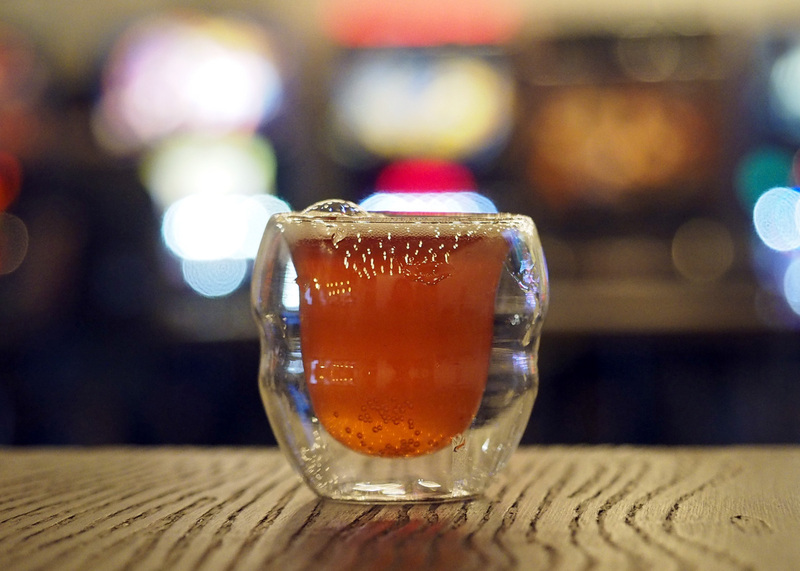 In my previous post, I talked about the fundamentals of Beer Mixology. Now, I’d like to share with you some of my favorite beer blends in hopes of inspiring you to try them and hopefully come up with some of your own (to share with me!). From the “beer blends” menu at the Bayou, this Lindemans Kriek Lambic with Guinness Stout floated on top really lives up to its name. It starts out smooth and chocolatey with the tart/sweet cherry flavors slowly emerging to become dominant by the end. 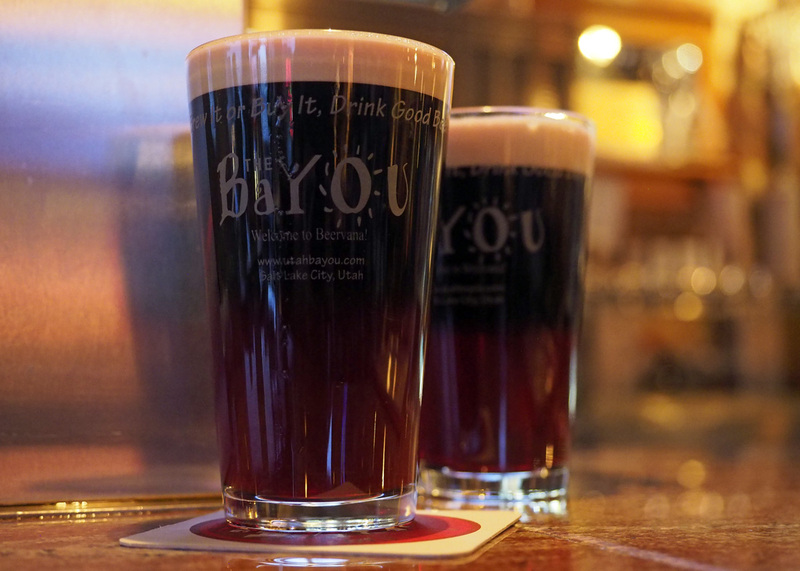 Raspberry is another dark red fruit that blends spectacularly with the chocolate flavors in a stout. I blended the Raspberry Sour and Breakfast Stout from 2 Row Brewing and enjoyed it very much. 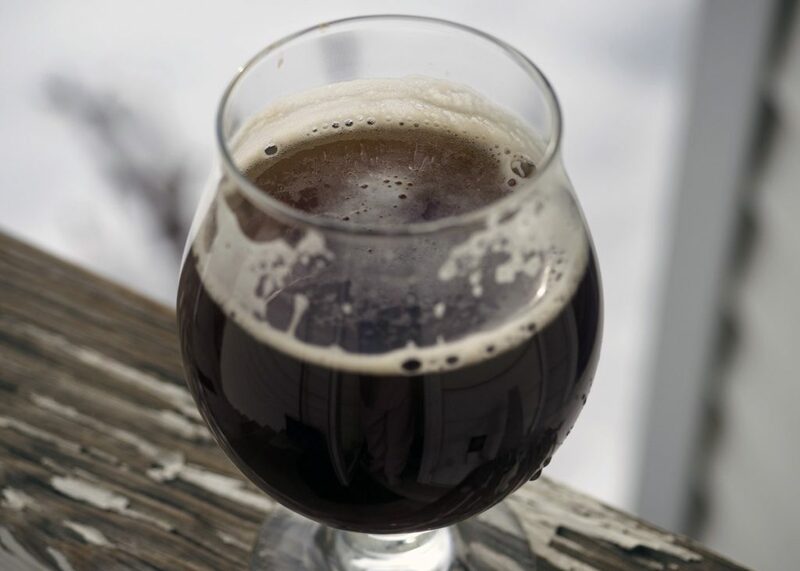 Be sparing with sours in stouts if you want to keep a robust chocolate flavor. Wasatch’s Jalapeño Cream Ale is so much fun to use in blends because it practically goes with anything! I love it with sours, hoppy beers (Wasatch Snap Down IPL), stouts or porters with chocolate/coffee notes, and fruited beers (Wasatch Raspberry Wheat). Fruits like peach, pineapple, mango, and citrus are ideal. Uinta’s Lime Pilsner or Flamingose Pineapple Gose are both lots of fun with the spicy jalapeños. 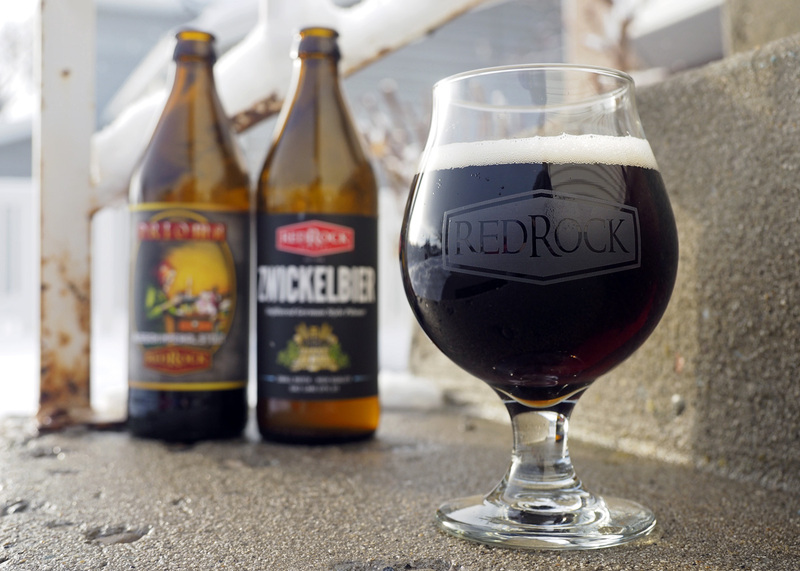 Combined with Red Rock’s Franconian Rauchbier (pictured), it mimics the flavors of smoky bacon-wrapped jalapeno poppers. This works well as a 2-1 or 1-1 ratio (jalapeno cream/rauchbier) depending on the level of smoke you like. 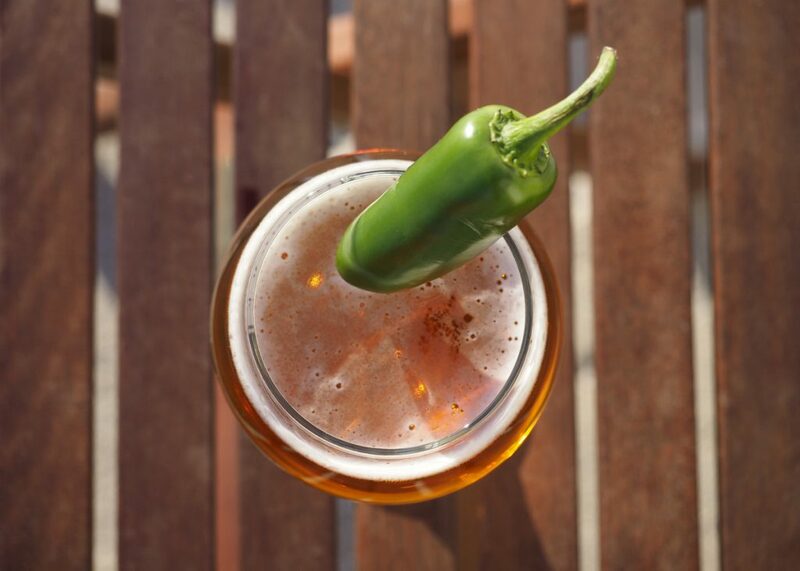 For a smooth jalapeño/smoke experience, also try with Squatters Nitro Red Ale. Take home the Wasatch Jalapeño Cream Ale in crowlers from the West Side Tavern in Salt Lake. I discovered, rather by accident, how well pilsners go with stouts. 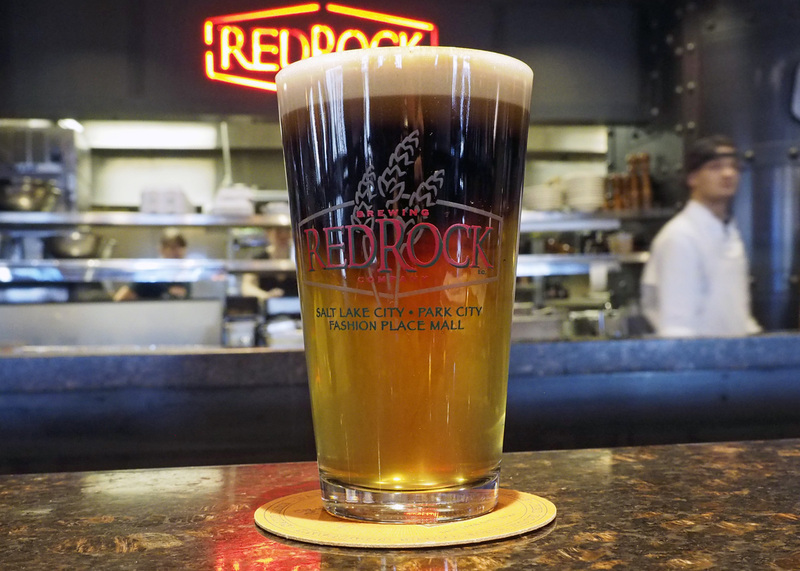 I tried to order a Black and Blonde (stout with blonde ale) at Red Rock, but they didn’t have the blonde ale available so I asked them to put their nitro oatmeal stout with the German pilsner. The chocolate malt in the stout went amazingly well with the floral hops in the pilsner. Just to be sure, I tried it again at home with a Zwickelbier (unfiltered pilsner) and a Drioma Imperial Stout (both from Red Rock) with similar results. The pilsner really brings out the roasted flavor of the malt. 2-1 or 1-1 (pilsner/stout) ratios work. When using imperial stouts, go lighter on the stout. They do pack a punch. The banana/clove flavors prevalent in the Grand Bavaria Weissbier from Red Rock make it a good option for a variety of combinations. I had it with the oatmeal stout on nitro and was super into it! Who doesn’t love a chocolate banana? Use a 2-1 (Grand Bavaria/stout) ratio. A coconut stout would take it to the next level, and a Berliner Weisse, with its sour lemon punch, would also work well with this beer. Otherwise known as the “Dirty Beach Bum”, the Kiitos NE Pale Ale is divine with the Coconut Stout. Bursting with pineapple-like hops, the coconut stout turns the hazy pale ale into a piña colada with a bit of chocolate malt sweetness to balance everything out. It looks like muddy water, but tastes great! 2-1 or 1-1 (IPA/stout) ratios will work. Don’t be afraid to try other iterations of the dirty IPA. Kiitos is a great place to start if you’re interested in getting into beer-on-beer pairing. They have an extensive secret menu of blends. You’d be surprised at how many of their beers can be mixed and matched. Be sure to order the “Power Ranger” (Mosaic Pale with Blackberry Sour). You can keep your dirty sodas, Utah. Give me dirty beer! 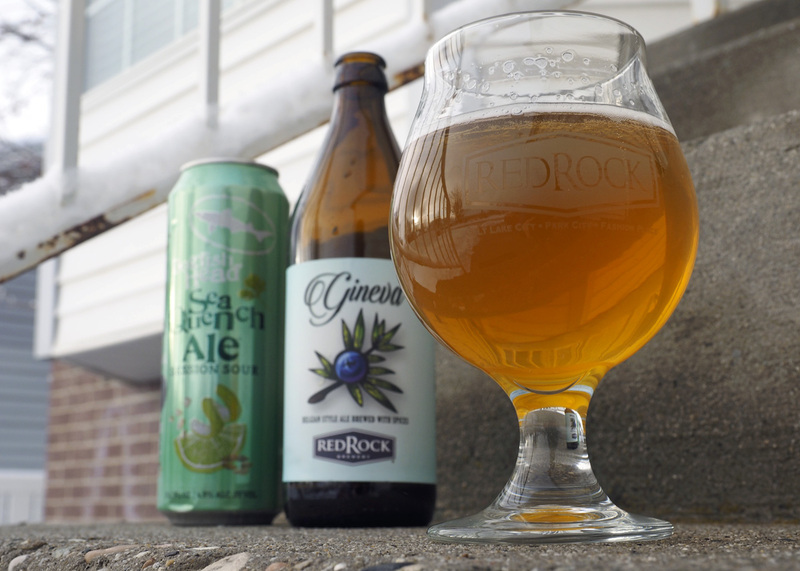 I’m a big fan of juniper berries and Red Rock’s Gineva has a healthy dose along with orange peel and kaffir lime leaves. The Belgian style is practically begging to be paired with some fruit flavors. I really like the lime aspect of this beer and decided to add some Sea Quench Ale from Dogfish Head. This session sour is brimming with lime flavor with a touch of salt that I think blends nicely with Gineva. A 2-1 (Gineva/sour) ratio is best to keep those juniper flavors popping. Try Uinta Lime Pilsner or Anderson Valley Blood Orange Gose if you can’t get the Sea Quench. I also liked Gineva with a bit of Drioma Imperial Stout. The dark malts bring out the juniper. Stouts are usually a good choice for Belgian styles with their fruity esters and spices. The possibilities here are endless. You have the power to create any flavor you desire. All it takes is the willingness to get out of your comfort zone and experiment. Now that I’ve gone down the rabbit hole, I’m not afraid to be lost in Wonderland. Go nuts, and don’t forget to share your favorite beer blends with us! Check our Facebook Page for a full photo gallery of beer blends. This isn”t the best whiskey barrel stout I”ve had, but it”s good in my book. One thing in particular I liked about it isn”t as heavy, so as a desert stout I can drink it and not feel utterly stuffed. Which stout do you mean?